Clint Eastwood’s directorial step into the Iraq war with this biopic proves to be clunky despite his trademark skill at getting the best possible performances from his actors. 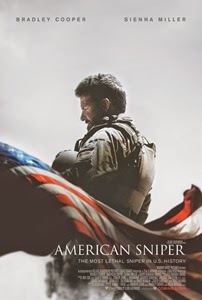 American Sniper is based off the real life heroics of one Chris Kyle, a Texan “cowboy” turn SEAL sniper during the war in Iraq. He was quickly realised to be the most lethal sniper in US history, called by his peers as Legend, with over one hundred and sixty confirmed kills to his name. The film charts not only his impressive career and the dangers he faced but more importantly his fracturing state of mind and the war’s influence on his family life. This must be the most stoic and intense performance I’ve ever seen from Bradley Cooper, turning himself from the know-it-all pretty boy into a muscular, patriotic and multi-layered soldier. You know what to expect going into a film directed by Eastwood; a film driven by stunning performances that drive home heart-string pulling sympathy and emotion, and he certainly rubbed off on Cooper. Kyle’s relationship with his wife, played by Sienna Miller, has a lot of chemistry and proves to be the best element of the film. But for all of this good chemistry (and without spoiling the story if you don’t know already) I found the film to be skirting around some of the real issues, issues that Eastwood would have given realgravitas to, instead preferring to show rather classic and archetypal war story beats. Scenes that could provide more emotional weight end before things are fully realised, at least I didn’t feel as moved by the characters and their peril as I could have been. A defining moment for this is the ending, literally the last few minutes were the most emotional of the entire movie, to the point were it almost feels forced. Being based off Kyle’s autobiography, and how seemingly patriotic he was as a person, one wonders how accurate the story’s antagonists really are, specifically an enemy sniper who’s skill could only be matched by Kyle himself. What could have been a moving character study that Eastwood would excel at, becomes a little cartoonishly heroic. It feels more like a movie about his incredible deeds (which are incredible) instead of a biopic about the man himself. Clunky is the word I would use. It was a decent film for Bradley Cooper’s performance and some intense moments, but it didn’t do enough to get me completely invested; I came away from it remembering a lot of standard war story beats.